More than just being a playard, this model also incorporates a removable rocking seat, which makes it a multifunctional addition in any nursery. The seat also features a well-designed handle, which makes it a snap to carry. It also has gentle vibrations, providing a soothing effect for babies. From its aesthetic appeal to the comfort that it can provide babies, this will indeed prove to be an exceptional choice for the best pack ‘n play available in the market. Check Price At Amazon.com! Read Customer Reviews at Amazon.com! Are you excited about the arrival of a new baby? Are you starting to plan how your nursery would look like? If you are shopping for the essentials that a newborn will need, do not forget to invest in the best pack ‘n play. The choices can be overwhelming, but this does not mean that you can just choose any model or settle with the cheapest option that is available. 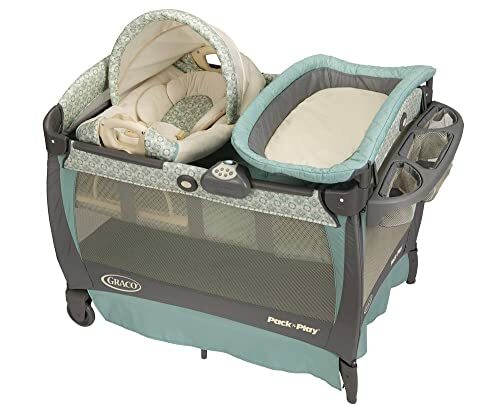 If you are looking for the best, one that should not be missed would be Graco Pack ‘n Play Playard with Cuddle Cove Rocking Seat. Made by one of the most trusted brands within the product category, it is sure to provide the best bang for the buck. Keep on reading to learn more about this model, which will help you to decide if it will indeed be an excellent choice for the best pack ‘n play. 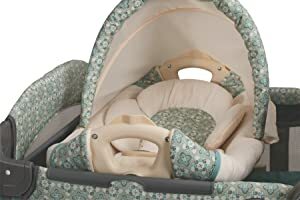 The following are some of the features that we loved about Graco Pack ‘n Play Playard with Cuddle Cove Rocking Seat, which might just convince you to have it chosen above other models. The removable vibrating rocking seat is one of the most distinct features of this model, providing it an edge above other models. Aside from being multifunctional, it is commendable as the gentle vibrations provide a calming effect on babies, allowing them to sleep quicker. This is also a good way to soothe them once they start feeling irritable. To make it even more multifunctional, the manufacturer also incorporates a changing table in this pack ‘n play. The changing table can handle weight of up to 25 pounds. This is a feature that will definitely make the life of parents more convenient. It has a cushioned rim to promote the comfort of babies. In addition, there are also three storage racks on the side, allowing you to have easy access to the things that will be needed by your baby. Another excellent feature of this model is the canopy. It is designed to provide babies with the protection that they need from bright light. This is especially useful if the pack ‘n play is going to be placed in a room where there is ample amount of sunlight during the day. For parents who are on-the-go or for those who always travel, this will also make an excellent choice for the best pack ‘n play. The bag makes it easy to have all of the pieces together in one place and carry it with you in a snap, wherever you go. 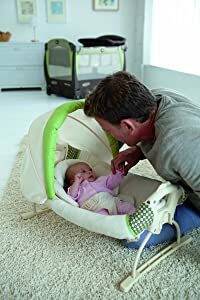 One more thing that you should be looking for in a pack ‘n play would be the features that will keep babies entertained, which will allow you to easily calm them down once they start being irritable. With such, this model can prove to be an excellent pick because it comes with five sounds and five musical songs, which will surely delight babies. Accommodates Growth of Babies: This will prove to be an investment that is worth your money as it can withstand many years of use. It will take a long time before your baby will be able to outgrow this pack ‘n play. For infants, the rocking seat will be useful. When babies grow, it can be used as a bassinet, and finally, a full-sized playard. Multifunctional: Aside from being useful through the years, Graco Pack ‘n Play Playard with Cuddle Cove Rocking Seat is also commendable because of its multiple functionalities. It can be used as a playard, bassinet, changing table, and rocking seat. Meaning, you do not have to buy different products to enjoy the functions that have been earlier mentioned. Comfortable: The pack ‘n play is designed with comfortable fabrics, which will also prove to be effective in terms of being able to maintain the right temperature. The cushioning is soft, which will surely be loved by babies. 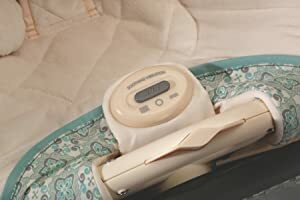 Machine Washable: It is also a good thing that the seat cover can be washed. This will be essential in being able to prolong the functional life of the playard. You do not have to worry about your baby making a mess as you can clean it in a breeze. Three Cubbies: Parents will surely love the presence of three storage racks on the side, providing easy access to the essential items that are needed by your baby, such as diapers and clothes. Weak Changing Table: In the reviews that have been shared by its users in the past, some parents expressed their disappointment with the weak changing table that is integrated in this pack ‘n play. It has minimal weight support, and hence, can be easily outgrown by some babies. Difficult to Assemble: Once it is taken out of the box, as some parents have revealed, assembly will not be a breeze. Even with the instruction manual, you might still find it a bit of a struggle to put the pieces together. In sum, weighing the pros and the cons of the Graco Pack ‘n Play Playard with Cuddle Cove Rocking Seat, it is apparent that the benefits outweigh the drawbacks. With this, there is no doubt that it will make an excellent pick for the best pack ‘n play. Many liked the fact that it is multifunctional, making it useful as a bassinet and changing table. It has a rocking chair with gentle vibrations, as well as music that can easily soothe irritable babies.